It was mid-July, and according to Mark Mooradian, I had about one week left if I wanted to witness the elderflower harvest at his Karnak Farm tea plantation in Saco, Maine. A few days of chilly, misty Maine weather was playing havoc with the crop. That’s all I needed to hear. After five or six years of hearing about Mooradian’s odd northern venture, I was hot on the trail, backing out of my driveway in Cambridge, my GPS programmed for Karnak Farm. I had visions of lazy swirling ceiling fans, covered verandas, maybe a pith helmet or two and a pot of perfectly brewed tea in the gazebo in the company of a man with a British accent. But it was not to be. Off the main road, in the middle of green pastureland and not much else, was a small sign for Karnak Farm. I pulled in, looking for a greeter. The pith helmet. Anything. It seemed that no one was home. Around the back, a modest, empty farmhouse. And then in a field, squinting distance away, I saw a squatting figure in a floppy sun hat in the middle of a garden row. “Looking for Mark?” she said as I approached, readjusting the brim of her hat. “He’s back there with the elderflowers.” And there was the orchard. More than 2,000 elderflower and chamomile bushes dotting the acres, looking like the toy trees on my brother’s old Lionel train set. Among them, on a ladder, was Mooradian. Scattered around him, with baskets over their arms, were three women in kerchiefs, carefully picking the blossoms off the shrubs, one by one, with utmost care. Karnak Farm is certainly the largest tea plantation—or herbal tea farm, if you will—in New England. 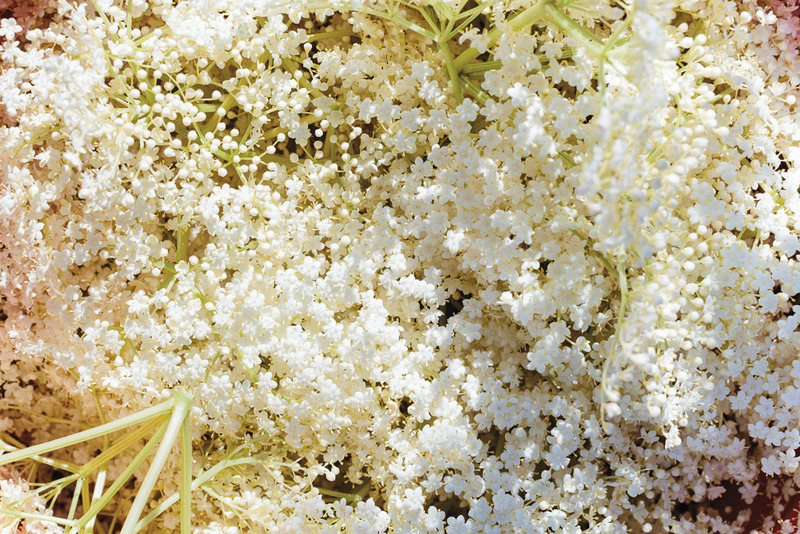 It’s also one of the larger elderflower growers in the country. Though Mooradian is not growing Camellia sinensis, the evergreen shrubs whose leaves and leaf buds are used to produce green and black tea, he is growing a phenomenally fragrant flower, floral with a hint of honeydew, for several popular varieties of herbal teas, a category of beverages served hot and cold that are surging in popularity. Tea is booming in the United States, with tea imports up 700% in the last 50 years, and tea drinking quadrupling from 2000 to 2014, according to industry sources. Herbal tea revenues are growing at 6% annually in the U.S., as our population gets older and attuned to the wellness trends that underscore the benefits of drinking herbs as a beverage. In fact, Mooradian quotes industry sources that calculate that Americans now drink more tea (including iced tea) on a daily basis than coffee. While the classic black and green teas come from plants that are most at home in Asia, the herbs, spices and other plants that can be steeped to make herbal teas—technically, infusions or tisanes—can be grown in almost any climate or quadrant of the world. Think of the wild mint or lavender in your garden; almost any edible herb grown in a sunny spot can be steeped into a creditable homegrown hot brew. So it’s no surprise that the American-grown herbal tea business is quickly becoming a billion-dollar enterprise with small and very large tea farms dotting the U.S. in Alabama, California, Georgia, South Carolina, Hawaii, Louisiana, Maryland, Michigan, Mississippi, New York, Oregon and Washington. Purchases in the largest of the farms are in the tons, with contract prices set years in advance. And now into this national marketplace enters Saco, Maine’s, Karnak Farm. First, a Coffee Company Through his 40 years in business, Mooradian has been on the cutting edge of the upscale American palate. He pioneered two beverage companies, Espresso Express and MEM Tea, each creating a market for a connoisseur’s take on what was previously a commodity or convenience. At that point in this country, “People’s standards for coffee weren’t that high. In 1979, there were maybe 100 espresso bars in the U.S., and 47 of them were in San Francisco. There were maybe 12 in Boston,” Mooradian remembers. Then, a Tea Company Over 16 years Mooradian’s East Coast busi-ness grew into a national niche enterprise, developing restaurant customers from Boston to California, including the fabled Chez Panisse in Berkeley. “It got to a point where if you were opening a restaurant of any stature anywhere in the country, we’d be one of the first calls you’d make,” Mooradian says. By 1999, he needed a new challenge. He knew every chef worth knowing in the country and all he needed to know about coffee. He sold Espresso Express and took his family to Armenia—a sort of roots trip for his children and a visit “home” for his American-Armenian mother. After his family returned to the U.S., Mooradian stayed on a bit. A friend who worked for an NGO had sent him samples of herbal teas collected in Georgia, Azerbaijan and Armenia, and he was intrigued, especially with the Armenian teas. Herbal tea has a long history in that part of the world as folk medicines and tonics for all sorts of conditions, moods and ills, as well as being a delicious soothing beverage. Like a bloodhound on a scent, Mooradian began an exhaustive self-study course on herbal tea around the world, quickly be-coming a walking, talking resource book on tea and tea history. Again, his timing was exquisite. With MEM Tea, he caught the first wave of the tea renaissance in the U.S.
Mooradian loved herbal teas but quickly realized that if he wanted to start a tea company he needed to source all sorts of tea, from black to green to white to herbal and beyond. 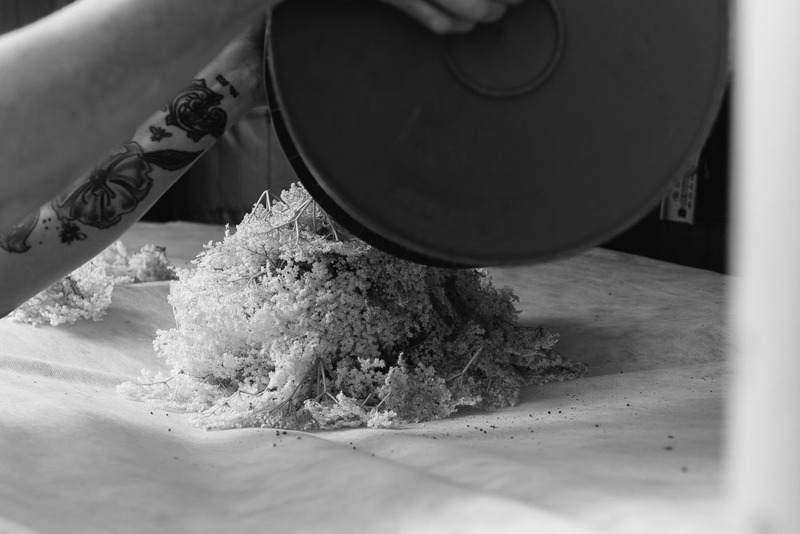 Early on, he was invited to present his tea at a Chez Panisse fundraiser. There he was introduced to the “celebrity circuit” of the tea renaissance. Tea, like coffee before it, had become a cult item. Much as he had been present at the birth of the coffee explosion, Mooradian fell in with the worldwide tea literati. He learned which tea to buy, whom to buy it from and whom to sell it to. MEM became a success in the burgeoning specialty tea world. But by 2010 Mooradian was ready to move on. He had decided that he didn’t want to simply sell tea. He wanted to grow it, too. Taking his evening walk through the Bedford, Massachusetts, conservation land at dusk one night a few years ago, he saw a huge elderberry plant growing wild. He went back later, grabbed it and planted in his yard, where it flourished. His success with this one healthy and productive plant convinced him that he could grow tea. Never one to dabble, he figured if one elderflower bush could succeed in his yard in Bedford, why not a forest of them, on eight serene acres in Saco, Maine? The first year on the farm, Mooradian planted 1,500 elderflower bushes and a three-acre field of chamomile, starting with seeds and seedlings. He waited as the roots took, as the voles nibbled, as the rains came, the winter snow buried and the sun finally shone. The first significant tea harvest came in years four, five and six. Herbal tea requires unique processing that takes the fresh leaves and flowers and turns them into tea, not just by drying them, but drying them optimally so that the resulting beverage is both delicious and healthful. In Armenia, this expertise rests in the hands of the grandmothers who roam the roadsides and know which wildflowers to pick and when to pick them, and how to dry them in the sun. Mark returned to Armenia to study with the grandmothers who dry their tea in ceramic towers in a climate that is hot and dry. Translating their accumulated wisdom to inclement, cold New England, Mooradian built a version of a solar dryer that he hoped would both dry and ferment the herbs. Getting the timing right for both steps is the essential challenge of tea production. Karnak’s solar dryer is modeled on what Mooradian calls “ancient Armenian tech-nology.” It is a high-concept but low-tech solution, depending on plastic sheeting and vents that he can open and close manually, no integrated circuits or silicon required. Mooradian quickly learned that he couldn’t do it alone. Or even with Kate’s help. He needed a dedicated staff of two or three volunteers to harvest as the flowers open and to keep picking every day for three solid weeks. Among his best volunteers were a mother-daughter team from Lancaster, Pennsylvania. The mother had grown up on a farm and knew exactly when the elderberry cherries needed to be picked and what a difference a 48-hour time shift can make. Nor is the weather a reliable friend for farmers in New England. In summer 2016, for three crucial days, Karnak Farm’s tea harvest was at risk. Hundreds of pounds of flowers were exposed to weather that was too cool and too wet. First a rain. Then a drought. And then three misty, drizzly days at the peak of the harvest. No sun to heat the solar dryer just as the flowers were about to open up and the temperature was declining. The magical temperature for the solar dryer is 70° with 60% humidity to activate the fermentation and the oxidation of the phytochemicals. The temperature is responsible for the complex change in the flowers that makes the difference between great tea and good tea. Mooradian knew just by the fragrance in his drying shed that it wasn’t going well. “For a great harvest, on a normal summer night, with drying in the day and humidity at night, you smell the floral scent permeating the drying shed in the morning,” he says. Mooradian calculates that he lost half the 2016 elderberry harvest. Thankfully, the rest of the summer was perfect for the tea crop. The elderberries and chamomile flowers were happily drying and fermenting, spending two or three days in the dryer, getting bagged up for sale by the fall. Overall, the farm’s 2016 was a moderate success. But Is It a Business? Can herbal tea be a business at Mooradian’s current scale? He is doubtful. He calculates that adding in his own subsidy, the cost of the tea comes to $72 a pound, and one pound of herbal tea can make 300 cups of tea if it were purchased and sold cup by cup in a restaurant. Contrast that with a cost of $20 a pound for a black tea like an Earl Grey. Herbal tea is a hand-processed product and Mooradian is hard-pressed to figure out how the costs to produce his herbal tea can go down. Karnak Farm, he knows, can’t succeed with tea alone. To make money, he needs to farm a variety of products. Last summer he planted back raspberries, which he thinks will make a great fruit tea. He has plans for a fruit and nut tea. Mooradian has doubled the size of his output once and hopes to double it again. He might have had four-fold increase in the harvest were it not for the pesky voles last season. If he doubles it again, he might break even in six years of farming. But as with all new farmers, the financial part has to be re-thought. When Mooradian considers the real cost of production—irrigation, land, paid labor, land acquisition and fertilization costs—the dominant cost is labor, and most farmers do not pay themselves a salary. Given his past business successes, he is able to sub-sidize the costs of the farm, even without factoring in his or Kate’s actual labor. He is not optimistic that a young couple can go into farming and afford to raise a family on a plot the size of Karnak’s. Having started the project at 60, Mooradian doubts he’ll be able to make it sustainable financially. But one of his objectives has already been a success: to understand what it takes for a farmer to become a real and successful member of society. Herbal teas need maximum heat to extract the phytochemicals and essential oils for medicinal impact and flavor profile. Heat the water to boiling for all herbal teas. You can even simmer herbal teas for 5 minutes to improve their bouquet and health benefits. Teas like oolong need less heat. Try for an average temperature of 175°F. 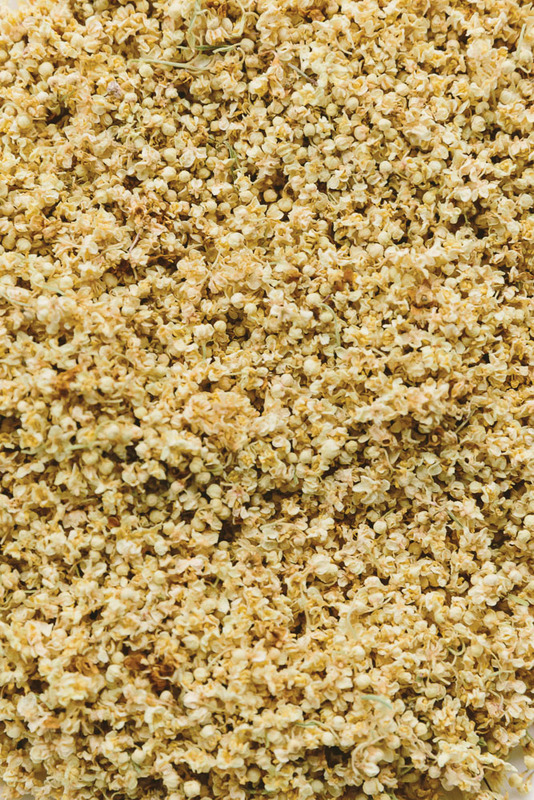 “Think of green tea as a green vegetable, like broccoli.” Brew for 30 seconds, plus or minus. Make sure it is clean, soft and pure.